Take a look, each individual makes a difference and must be respected. Rahul Infotech was established in Pune in 2013, and has been providing quality coaching to students ever since. It provides specialized training for students undergoing the Accountancy Courses. Right from the beginning, the Academy had committed itself to providing high quality and result-producing coaching, based on a dynamic approach. The unique coaching method and the resulting successes began attracting more and more students. 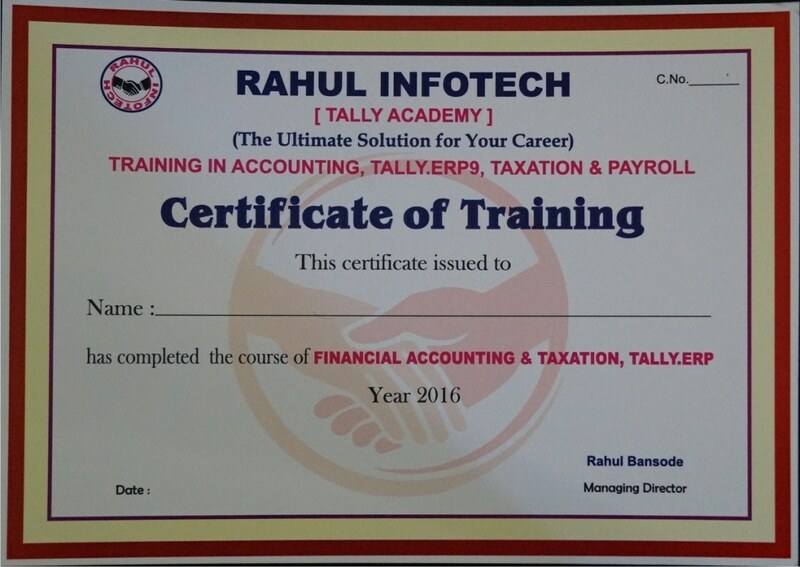 Rahul Infotech Academy is run by Mr. Rahul Bansode, who specializes in teaching Accounts & Motivational Lectures. Student will be trained in the areas of Accounting Finalization, Taxation and online return rectification. The courses are designed to give conceptual clarity on Accounting and Taxation. The objectives of these courses are to provide students with working knowledge in Accounting and Taxation with a view that these records need to be submitted to tax Authorities such as Income Tax, Sales Tax etc. Students will get to work on Tally Software and get practical exposure so that they are Ready to give best in work from Day 1 on Job . Some highlights of these courses which will give our students the EDGE to move ahead in their CAREERS! The Academy conducts model examinations to boost the confidence of the students. The conceptual explanations will be duly supported by practical examples, reference material, past examinations and revision test papers. We inspire students through motivational lectures. We don't only teach in the class we complete syllabus thoroughly in the class itself by taking frequent cumulative revision, regular test. Our batch size, no of rankers and their score itself speaks about our quality. Each individual must be respected. Excellence and superior performance must be pursued and encouraged. We aim to improve our performance with each passing day. We believe in creating interest in the subject. The Passion and Energy with which we teach makes difficult subject easy. Best Value for your time and money.